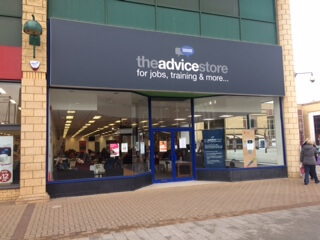 A busy start to 2019 with the new year bringing new premises for the HeadsUp Basildon team, as they have moved into the brand new Advice Store in Basildon town centre. With the whole square undergoing redevelopment our Peer Support Worker looks forward to welcoming more interest and drops ins from anyone wishing to find out more about how HeadsUp support people who have experienced common mental health problems, back into the workplace. Curious passers-by all look through the windows of what was a boarded up fancy dress shop over the past 3 years! Our new position is definitely helping us reach many different people from the local community as we have seen a rise in those not in receipt of unemployment benefit coming through our doors. HeadsUp colleagues have also been busy doing outreach at the Eastgate shopping centre, where they spent a day with a promotional stand raising awareness of what’s on offer. It was a productive event and as a result we made contact with a number of potential partner organisations. We are now looking forward to what February presents us with !